Some ergonomic accessories are more than mere extensions of your workspace - they're necessities. Pair your adjustable height desk with the Raynor Ergohuman Chair - Mesh with Headrest, and you'll have a supportive work center that will keep you productive for even the longest days. Aluminum trim and chrome accents start off the collection of stylish features, with options to customize even further with a handful or mesh seat color options to match with your unique office flair. Factor in pivoting, adjustable arm rests, an adjustable headrest, vertically adjustable lumbar support, synchro-tilt, and tilt-tension control, the Ergohuman Chair model ME7ERG by Raynor includes the essential ergonomic features needed for all day sitting, giving you ample support where and when you need it. I've seen a version of the Ergohuman with a footrest. Do you carry that? The Ergohuman model you are referring to is an overseas knockoff and is not an official part of the Ergohuman line. We only carry brand new, authorized Raynor Ergohuman chairs that come with the full limited lifetime warranty. I have a part that needs to be replaced on my Ergohuman. Can I submit a warranty claim? If you are the original purchaser of the Raynor Ergohuman Chair, then your chair comes standard with a limited lifetime warranty. Our team can walk you through the steps of getting the warranty claim started. If you are not the original purchaser of the chair, then you can order replacement parts for your Ergohuman chair through us. Either way, we will have you back to sitting pretty at your desk in no time. The Ergohuman ME7ERG has an adjustable back that moves up and down to help position the lumbar in the correct position. The lumbar itself is not adjustable independent of the back rest. What is the difference between all the versions of the Ergohuman? Upholstery is the main difference between the chairs in the Ergohuman line. In addition to different upholstery options, you can also order your Ergohuman chair with or without a headrest. What's the difference between the ME7ERG and the LE9ERG? The only difference between these two chairs is that the Ergohuman ME7ERG Chair is mesh and the Ergohuman LE9ERG chair is bonded leather. Other than upholstery, they are exactly the same chair. I love the color options for this chair. Are there color options for the frame as well? No, the frame is only available with a chrome base. The Raynor Ergohuman ME7ERG Chair is available in six mesh colors: black, plum red, orange, green, blue, or gray. The colored mesh choices feature interwoven black mesh. 1) The lowest seat height is too tall, which causes pain, poor circulation, and other issues. I have a footrest to compensate for this when I'm seated in front of my computer, but sometimes I move around within my workstation and can't take the footrest with me. 2) The seat, itself, even with a footrest, causes pressure points that are not only uncomfortable after a couple minutes, but makes my legs and feet start to go numb after a short while. 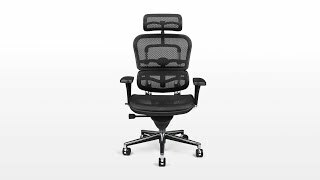 Make no mistake - this is NOT the high end mesh like in the Herman Miller Aeron chair and seems to lack the flex and body conformity of the latter. 3) The headrest does not go low enough to sit within the curve of my neck, and that causes it to push my head forward, which causes neck pain and forward pitch or "hunch" to my overall posture, which in turn causes both thoracic strain and kind of negates the nice lumbar support. The headrest also cannot be removed. 4) The arms are too far apart, and there is no adjustment for this. When seated with the arm height adjusted correctly, my forearms are so far apart that the angle and rotation of my shoulders feels unstable and uncomfortable, especially if I were to attempt to operate a mouse or keyboard from this position. After reading reviews of office chairs for small or petite people, including the one listed below from this website, I am planning to try a Steelcase Leap chair. Hopefully there is someone else in my office will find the Ergohuman ME7ERG to be as fantastic as most of the other reviewers here. This chair is awesome! It has high quality parts, very adjustable, and rises up pretty high, which is great for my standing desk add-on (the add-on brings the seated setup of the desk up an inch). I got the blue fabric and it looks really good, actually a lot like the picture they advertise it with. Its also very comfortable and makes 3-5 hours stints of working very manageable. The chair is solid and well built, without looking massive and out of place in my house. I like having only two controls on the side of the chair. I only needed to look at the instructions for the main control lever once, and find it much easier to use than the three levers or more found on most office chairs. The fully mesh upholstery gives just enough, and avoids heat buildup in the seat (which aggravates a physical issue I have). I ordered the green/black mesh, which is darker than I anticipated, so I encourage you to request a swatch before you buy. Shipping was prompt, and packaging fit for purpose. The box the chair comes in is larger and heavier than you might expect, so prepare yourself. I watched a video on how to assemble the chair, so was able to do so very easily. All in all, I have had the chair for about a month and am very satisfied. The only negative is that I wish the chair could recline a bit more than it does, but I did check the specs before buying so knew about this. When I asked for better chairs in our lab at work, our folks found this ErgoHuman chair. Our lab techs use these 24/7 and they have stood up to the test of time and the test of our bodies. We've had them for several years at work and they are still as good as the day we got them. The design has been ideal for all types of people and especially for me with my back arthritis. At home, we were able to put the chair together easily. The comfort is amazing and I have no more back pain from working in my office. My office chair was becoming increasingly uncomfortable, and I started searching for some ergonomic options. This chair seems to get fairly consistent high ratings, and it comes in plum/red mesh, so I went with it. Assembly was pretty straightforward, once I got a better allen wrench (the one supplied with the chair didn't give me enough torque), and the chair is comfortable and it's easy to change my position while seated. I work 10+ hours per day as a telecommuter and have struggled to find a chair that doesn't cause more issues with my chronic back problems. I'm loving this chair! It is very comfortable especially with the dynamic lumbar support. I'm able to get this chair adjusted to meet my needs. A pleasant surprise was the wheels that glide like skates on ice across my floor not making one sound or concerns with marking my new wood floor. I highly recommend this chair, it is well worth the investment. Several years ago I read the reviews about this chair easing their back pain. Having suffering chronic back pain most of my life I read those reviews with interest. I didn't believe just sitting in a office chair could be therapeutic, but since I needed a chair anyway I thought, why not? What I found is that the unique adjustments allows the chair to apply presser where it is needed to prevent vertebra from pinching the nerves in the effected area. I used to take regular moving-around brakes. Now, With this chair, I don't take "relief" brakes anymore! Plus, I love my power naps in the chair. Cons: That I didn't find it sooner. What more can I say? I have never had a chair that didn't leave my back hurting half way through the day. This chair is such a pleasure to sit in that I work longer hours now! No doubt my boss will buy them for everyone now! Pros: Seat and back tilt independent from each other. Back and lumbar support height adjustable. Head rest is actually usable. No desire to sit forward in my seat. $699.00 List Price: $1,310.00* The list price is the same as the MSRP (Manufacturer's Suggested Retail Price). It may not necessarily be the price at which the product is sold.